January 27, 2017 marked 10 years of service for the Portland Aerial Tram! The tram celebrated with a community celebration, historical displays, presentations on the construction of the Tram and the future of South Waterfront and more. Almost 14 years ago, an innovative public-private partnership led by the Portland Development Commission began to transform this once-isolated and largely abandoned area, investing $125 million into streets, parks, affordable housing and transit – including the now-iconic Tram. These investments attracted more than $1 billion in private investment and have had far-reaching impact, not just for the city of Portland, but for the entire region, in terms of job creation, innovative advances in science and technology, the growth of our valued educational institutions, and tourism. PDC’s specific contribution to the design and construction of the tram, on behalf of the city, totaled $8.5 million, and paved the way for the continued growth of OHSU. The City, PDC, and development partners at OHSU and Zidell are now focused on the opportunities directly north of the tram that will leverage earlier public investments in the Central District and the Portland-Milwaukie Light Rail. The City is supporting OHSU’s Knight Cancer Research Building through the construction of SW Bond Street, and the development agreement with Zidell for the redevelopment of their 30 acres further delivers on the City’s goals for a neighborhood that flourishes with transportation, parks, open space, 10,000 quality jobs and 3,000 new housing units with many affordable options. The design of the transportation system in South Waterfront has transformed the area from a landlocked island to a multimodal paradise. Residents and visitors can use Portland Streetcar, TriMet’s bus or MAX light rail, they can arrive on foot or bike via dedicated paths, or even by car. In the weeks leading up to the 10 year anniversary, Portland's transportation system was shut down by historic storms. The tram was the only transportation system that was not heavily impacted by the storm and instead worked overtime to deliver people safely to work, school, and home. See more pictures like this in the historic gallery. The Aerial Tram’s BIKETOWN bike share station is the second highest used out of the 100 stations. Over 1000 riders use the two Portland Streetcar stations at the base of the tram each weekday. The Portland Aerial Tram has made half a million trips and carried over 16 million people. The Portland Aerial Tram has traveled 320,000 miles, almost 13 trips around the circumference of the Earth. The Darlene Hooley Pedestrian Bridge at Gibbs Street has provided a vital connection from the Lair Hill neighborhood to South Waterfront. The Portland Aerial Tram is looked at as a successful model and leader for construction and operation of aerial public transportation. Many other cities look to Portland as they study a possible aerial transportation option within their own city. Go By Bike’s free, public valet parks over 300 bikes a day, making the Portland Aerial Tram home to the busiest and safest bike parking operation in the city. Tram Executive Management Committee; Tram Operating Group; OHSU; PBOT; Doppelmayr; PDC; Lair Hill neighborhood; South Waterfront Community; Portland Streetcar; TriMet; Go By Bike; And many others that have all participated in the success of the Portland Aerial Tram. Congressman Earl Blumenauer at the 10 Year Anniversary celebration. See more pictures like this in the historic gallery. "Portland’s aerial tram can now be seen as one of the city’s most transformational projects ever." - Oregon Public Broadcasting. Ten years ago, Portland’s highest hill could only be conquered via narrow, winding roads lined with dense forest and a steep cliff. Yet Marquam Hill was also a growing regional medical, academic and research destination. 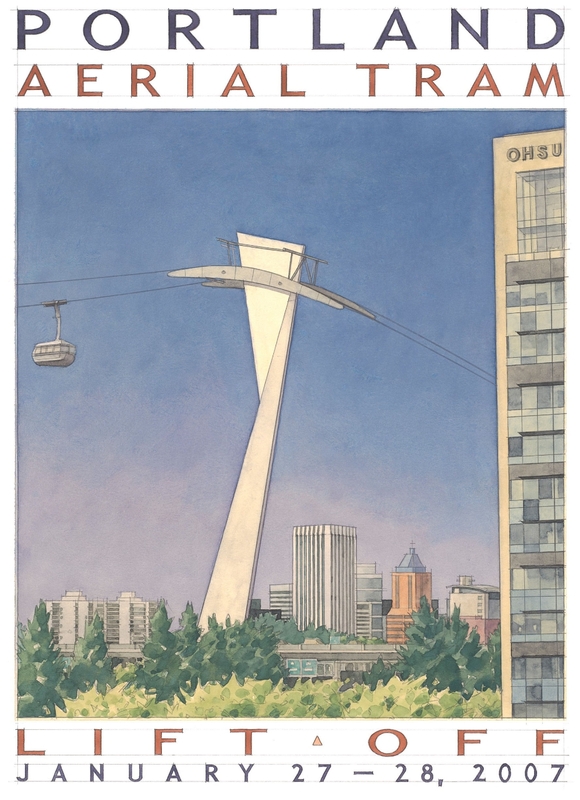 Portland needed an engineering marvel: An aerial tramway. The landmark has been chronicled internationally by travel writers and delighted visitors of all ages. From the cabin, one can see all of Portland and miles of the Willamette River Valley; on a clear day, as far as Mount St Helens and Mount Hood. South Waterfront has been transformed from brownfields into Portland’s newest community, home to food trucks, parks, farmers’ markets, festivals, the nation’s largest car free bridge, and perhaps the continent’s busiest bicycle destination. Learn more about the many aspects of this unique transportation system.